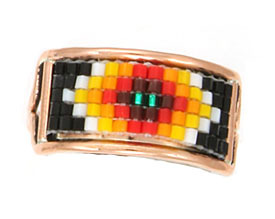 This ladies ring is crafted out of copper with 5 rows of multi colored beads. Top of ring measures approximately 7/8" long across with curve by 7/16" wide. Crafted by Navajo artisan Geraldrita Whitethorne. Colors and patterns will vary. Also available in nickle silver. Available in size 7 1/2 thru 10. Choose size and metal when ordering.